← Record Review: Adam & The Ants – A.N.T.S. Disclosure: I collect Simple Minds. I have most of their records. They have their ups and they have their downs. I disparage almost a full decade of their output, but those first seven albums are magic to me. If I had only a single Simple Minds album to take to a desert island, this unique, US-only compilation, would probably take the cake. This album is anything I think you’d need to play cold to a person in order to infect them with the Simple Minds virus in a strong way. Material from this record was my entreé to Simple Minds fandom and look at me; I kept listening through nearly a decade of really lame efforts from these guys. People I met later in life, who didn’t grow up with this music and only knew them from their chart topping mush period, looked at me funny when I extolled their virtues. What is delivered here is a band combining unique and disparate influences into a unique whole. The set opens up with the LP mix of “I Travel,” my pick for the most thrilling post-punk record ever. To hear Jim Kerr talk about it, this record was the result of hearing the seminal “I Feel Love” by Donna Summer and Giorgio Moroder. The Minds also used a sequenced, repetitive riff to build the song on but they seriously upped the b.p.m. of the track and introduced what sound for all the world like acid house synth voices eight years early. Original drummer Brian McGee set down an unvarying, slamming motorik beat ripped straight from the Krautrock playbook. Then they let guitarist Charlie Burchill loose on it during the time that he was determined to sound like anything but a guitar. The effects are layered on so heavy that the guitar sounds like a flexidisc of a recording of a guitar. The net effect is not unlike a freight train threatening to skid off of the rails. Magnificent. And it namechecks Brian Eno! The rest of this album is the créme de la créme of the “Real to Real Cacophony,” “Empires + Dance,” “Sons + Fascination” and “Sister Feelings Call” albums, when the band was inarguably at their zenith. “Premonition” is the band’s first example of peaking from the “Cacophony” album. The cut is based on a sinuous bass riff courtesy of Derek Forbes, as were most of these songs at the time. They obviously evolved from open jamming and give the tracks a groove emphasis that simply can’t be beat. The band heard this track actually played in a German disco and it opened their eyes to the power of uniting trance rock forms with eurofunk. “30 Frames A Second” should have been the third hit single from “Empires + Dance” but the first two singles [“I Travel” and “Celebrate”] inexplicably stiffed. The trance-inducing cut about returning home to an existence that you no longer recognize is amazing, cinematic songcraft and performance. “Sweat In Bullet” is based around Derek Forbes muscular fretless bassmanship. The man gets huge accolades for picking up a fretless yet sounding nothing like Mick Karn or Jaco Pastorius. The man is undeniably the Scot god of bass; right up there with Bootsy Collins or Mick Karn, yet I sometimes feel like I’m the only member of his fan club. “Love Song” is best heard in the LP version. The 7″ edit loses the incredible random sawtooth waveform intro but the track still retains its anthemic qualities. “The American” is also best appreciated in the full-blown 12″ mix, but to be honest, this is the same version on “Sister Feelings Call.” The interplay of drums, guitars and keyboards builds an inexorable cycle of power that climaxes at the guitar solo/cold ending here, but the 12″ version then leads into a fantastic breakdown of the vocal chant of the chorus. A-mer-i, A-mer-i, A-mer-i, A-mer-i, A-mer-i-can! Finally, “Theme For Great Cities” ends the album with a cut that’s since become a classic chillout track, made almost a decade before there were classic chillout tracks. The band have since revisited this cut with a ’91 version on the flipside of their “See The Lights” single and again with ’98 Fila Brazillia remix of the original track. When I saw the band in 2002, this cut was their first encore and it didn’t sound dated at all. This album distills the excitement that I found the band had to offer before becoming soft and bloated stadium fodder. I suppose that artistic [if not commercial] downfall may have been a natural progression of producing seven album in just four years to much commercial indifference. This particular album existed because the band were touring in America in 1981 and someone noticed that they had not had an album released in the States since their debut in 1979. A one-off deal was signed with… Stiff America…? This album was the result. Designer to the stars Malcolm Garrett, who has a long and storied career with the band, produced a unique cover that fits with his single covers from the 1981 period rather well. This album is an interesting curio for the aficionado and a powerful gateway drug to the uninitiated. If your experience of Simple Minds begins and ends with “Don’t You Forget About Me” than by all means look for this rarity in the bins and get ready for an education. This entry was posted in Core Collection, Record Review and tagged Simple Minds. Bookmark the permalink. @Brian Ware – Actually, the first time I heard Simple Minds was when I bought the 2×7″ of “Sweat In Bullet” in late ’81 just because I had heard the band mentioned in music magazines for about a year at that point, and I never heard Simple Minds on the radio… meaning at that time WPRK, the college radio station available to us that was actually playing this newfangled music. “Sweat In Bullet” on 7″ was an effective way to sample the band for $3 – four great tracks! It was a few months later when “New Gold Dream” was released and I bought it straight away. At that point I kept up with each single and started working my way backward. 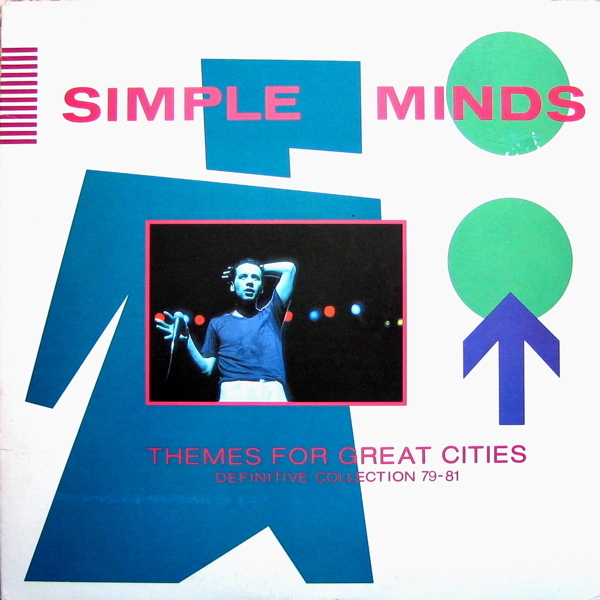 This compilation was my introduction to Simple Minds. The fact that it was on Stiff made it even more important to me. Excellent starting point for Jim Kerr and co.
@Vinny Vero – Aaaaah, Stiff Records! Now there was a label! One of the classics up there with Factory, ZTT, Virgin and Compact. It’s hard to believe that SM ever crossed wires with Stiff America, but as I mentioned, that was a fast one-off deal to give them a foothold to tour on. My pal ronkanefiles saw them in L.A. on that ’81 tour, th’ lucky sonnuva… Sigh. I never saw them with Forbes on bass – to my everlasting pain. The ’86 tour with Giblin was a real kick in the teeth! That painful! After “Sparkle In The Rain” I actually wrote to A&M for tour date info and of course they came no closer than 800 miles away. At least I saw them in 2002 with Eddie Duffy, the closest thing they’ve managed to a second great bass player. Now he’s out of the picture. We’ll see where it goes from here. But you’re right. It’s a fantastic intro to the band. The compiler did a great job. I remember the Stiff America compilation, but never went near it. Snobby about the band already, it was UK original vinyl or nothin’. I probably still like “Reel to Real” the best, only because it has never (ever!) been ‘over-played’. Yes, I did see them exactly at the time that “Sweat In Bullet” was their big single. Great show, nearly 30 years down the tube. I lost the plot shortly after SAF/SFC…but I still like some 12″ singles. @ronkanefiles – I actually have two copies of that Stiff comp. SM collectors are willing to pay decent money for it so they are my aces in the hole if it comes to that. One thing I love about discogs.com is that when I view my collection, there’s a tab option to view your collection arranged by value. Values are calibrated according to the prices that the releases have sold for from discogs.com dealers – with minimum, median and max values according to the last ten sales of the title. It’s fascinating to do a value sort and see what the most desirable releases in your collection are reaching at market value. I actually bought Empires and Dance and perhaps some other early stuff of theirs, but ISTR that Glittering Prize was what really did the trick for me. It was nice to see them get recognition on the radio in the mid-80s but they were (as seems to happen so often) getting rewarded for their worst tendencies. glad they crawled their way back, a la OMD. @chas_m – Re: Simple Minds ca. 1985 – I could write a book on the vast number of bands I collected who went off the rails in the dreaded mid-80s and sorely disappointed me. At the very least, there’s a week’s of blog posts in that topic [memo to self]. You are ceretainly not on your own as regards Forbes. I was very lucky to be learning the bass back then and he was one of a number of quirky, creative, left-field bass players to be inspired by and to learn from. Bruce Foxton, Mick Karn (sadly departed), John Taylor (a very under-rated player) and above all Derek Forbes. Top geezers all of them. Ramon Brennan – Welcome to the comments! The Cult Of Forbes is indeed widespread. Such that it’s a [new] religion, and not just a cult. Thanks for noticing John Taylor. He may be a bimbo, but to my ears, he’s the biggest talent on the Duran debut. And Mick Karn was the subject of the very first post her at PPM many years ago. But Forbes… I listen to “ New Gold Dream [ 81, 82, 83, 84]” for the last 20 years and all I hear now are the bass lines. I was about 14 when I first heard Simple Minds commercially attractive single, Don’t You. I spent the next 6 years immersing myself in their back catalogue, most of which I picked up at Vinyl Villains on Leith Walk and these tracks remain timeless in comparison to their later stuff. daccad – Welcome to the comments! Yes, we fall hard for Simple Minds around here… because of ’79-’84…except when we don’t! If you have a few hours to kill, may I suggest the Simple Minds Rock G.P.A.? It’s the legendary thread of almost a hundred posts that must constitute some sort of pseudo book on the band, albeit without the benefit of editing. YES – thank you – it’s a crime how underappreciated Simple Minds pre-“Don’t you forget about me” are. Even though I consider a lot of their contemporaries to have made timeless genius records (the pre-1983 eras of Depeche Mode, OMD, Human League, etc) it turns out Simple Minds have more tracks that have aged better than any of those. Yet they don’t have the synth-pop caché of those groups; they’re too arty and experimental, even too experimental to fit in the Roxy Music art-pop category. Based on sound their closest contemporaries are late-70s-early-80s New York underground disco (aka no wave or no disco) or maybe German experimentalists such as Can but no one would be caught dead mentioning Simple Minds in the same breath as those. I include Sparkle in the Rain in this era albeit alone in its own niche, and consider it one of the best-produced records of all time. I mean up there with Sergeant Pepper and Pet Sounds.